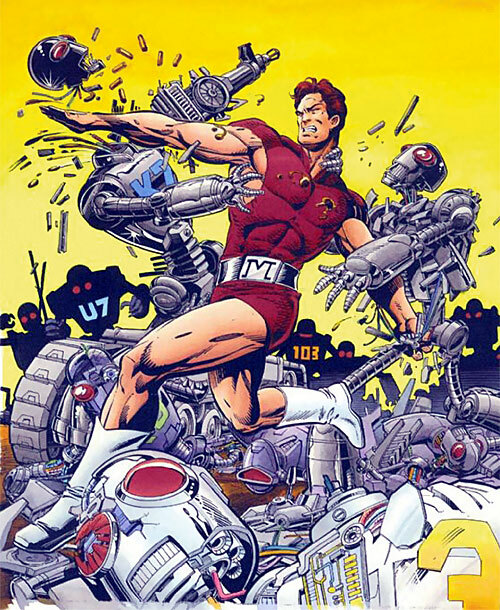 Magnus, Robot Fighter is a minor but classic comic book character. He first appeared in 1963, created by Russ Manning and published by Gold Key. The character would return later, under different publishers. 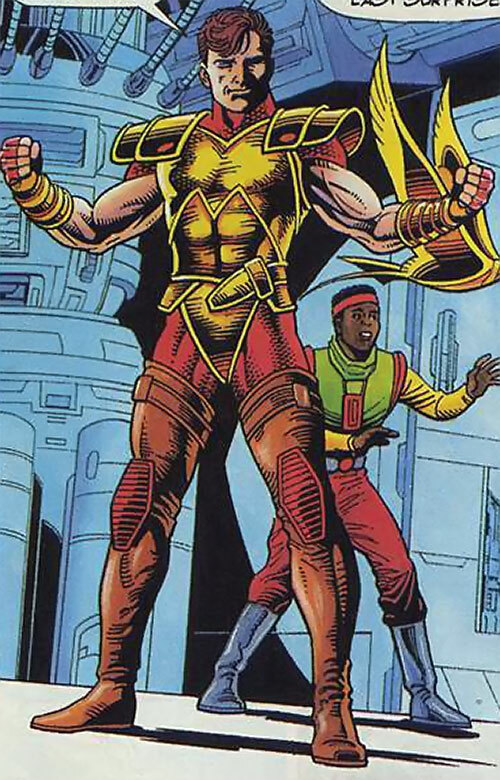 *This* profile describes Magnus as he appeared from 1991 onward as a Valiant Comics character. 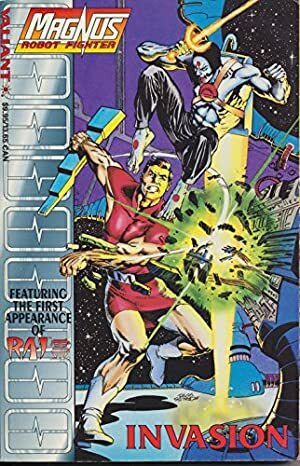 Valiant was one of the new publishers would tried to carve themselves a beachhead on the booming comic book market of the early 1990s, only to perish when the bubble collapsed. Much like Magnus, it returned years later – but this new era isn’t covered here. 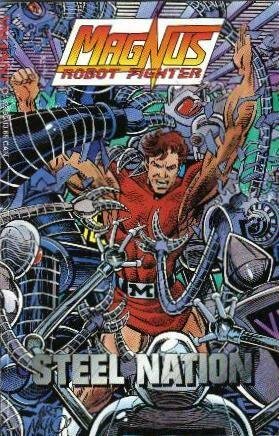 Other Aliases: Magnus, Robot Fighter. Known Relatives: Kris Halloway (Mother, deceased), John “Torque” Torkelson (Father, deceased). Group Affiliation: Government of North Am. Base Of Operations: North Am. Height: 6’2” Weight: 220 lbs. 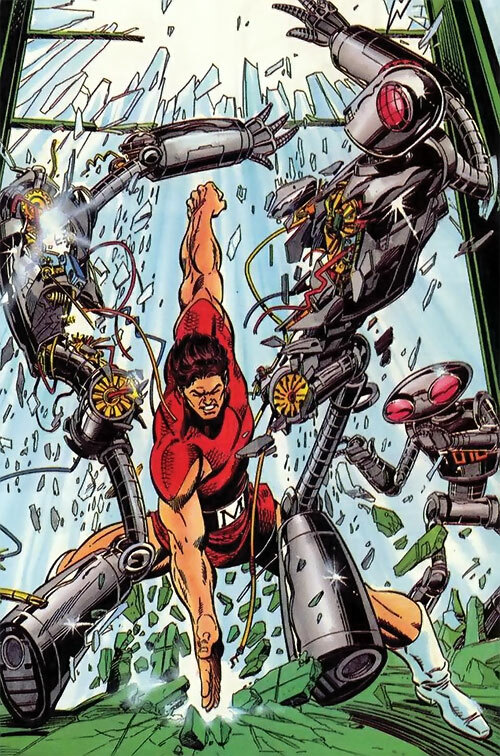 As a second generation Harbinger (Seedling in a WildStorm setting or Mutant in the Marvel Universe), Magnus has inherited his father’s capacity for superhuman strength. Though its exact limits are currently unknown, Magnus’ strength has proven to be sufficient enough to rend metal with his bare hands and catch falling automobiles without strain. His strength extends itself to his natural durability. Though he can (and often has been) be injured, his body is capable of resisting intense impacts. 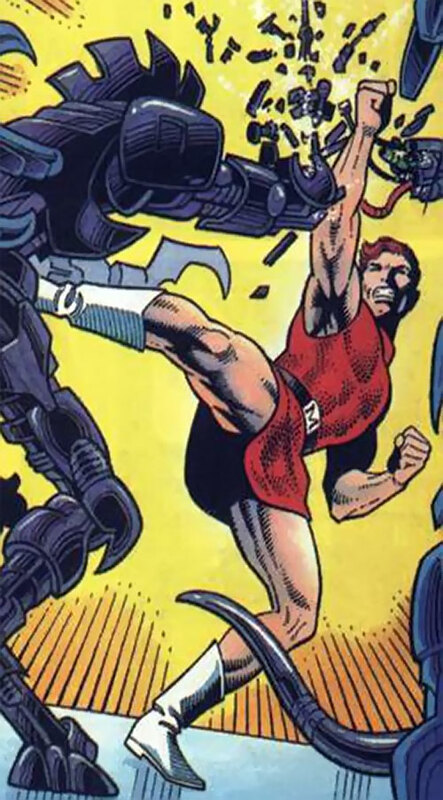 Outside of his Harbinger based abilities, Magnus has been intensively trained in the martial arts and acrobatics for the first 20+ years of his life. His training had a very specific focus; smashing robots. 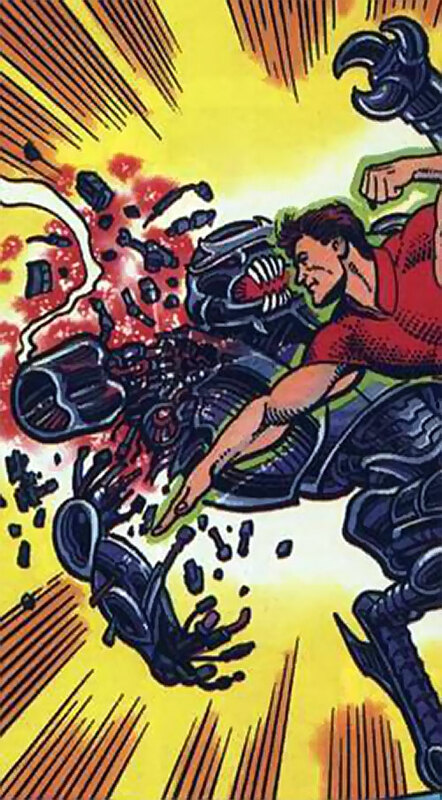 With this in mind, one should not be surprised by the fact that while Magnus is a deadly hand to hand combatant for any mortal opponent, his ability to maim and/or obliterate robotic opponents is without equal. With every thrust, chop, punch or kick, Magnus drives his powerful limbs directly through his targets, leaving broken and crippled opponents behind. He is more than capable of taking on a score of North Am built robotic servitors simultaneously and rendering them all to scrap. The hard truth is, the best way to survive hand to hand combat with Magnus is to avoid it completely. Magnus rarely employs any form of weaponry outside of the ones at the ends of his arms, but he does wear an armoured tunic made of ceramic-durium fibre. The tunic itself acts as a suit of armor that protects him from harm. It is most effective at absorbing and dispersing the high intensity energy blasts generated by 39th century plasma weaponry. Initially, it was mistakenly assumed that Magnus’ training gave him the ability to focus his will into his hands granting him the ability to shatter metal with a touch. This has been debunked with the revelation of his Harbinger origins. The robot 1-A was manufactured 410 years before the man named Magnus fought his first robot. 1-A was the first robot tech officer in the solar fleet. He was designed to fight the Martian uprising in the year 3591. 1-A was assigned to the serve aboard the cruiser Ottawa. He did so without fail until the ship took a stray proton torpedo over Syrtis Major. The explosion caused a strange surge of power that flowed through everything on the ship, including 1-A’s cortex circuitry. As the surges died off, 1-A realized something … he was thinking unique and original thoughts for himself. He had become a “free will” robot. With is new found freedom, 1-A attempted to reach the bridge. His goal was to persuade the human captain to abandon ship. But to his shock he found her under the assault of E6, one of the other robots that had also gained sentience. 1-A terminated the rogue robot, but was still too late to save the Captain’s life. He then used the remaining escape pod to returned to Earth. There, 1-A spent the next several decades analyzing what had happened. At the conclusion of his research, he came to a grim realization. He realized that the odds against a robot accidentally gaining free will, as he had, were 11 billion to one per century. At that time, in the year 3610, the number of robots in service in North Am alone was nearly 15 billion. With the numbers of robots increasing so drastically and so rapidly, 1-A supposed that it was only a matter of time before another robot or robots gained sentience like he did. What if that robot(s) were like E6? In that instant, he realized that humanity needed a weapon that could battle the rogue robots as they appeared. No, not a weapon; humanity needed a champion, and it would be his responsibility to create one for them. 1-A threw himself into his work with a vigour and dedication that only an artificial being could maintain. He upgraded his own robotic body for battle. When he found that he had no talent for it, he experimented with other robotic servitors. Ultimately, all of his attempts failed. It was at this point that 1-A literally stumbled across the solution to his dilemma; a tiny, crying, squirming package. Without understanding how or why, 1-A instinctively knew that the infant would be his champion. 1-A spent the next 25 years rigorously training the infant in all manner of academia. He taught him about literature, science and all of the great achievements that humanity had accomplished. The youth rapidly absorbed 1-A’s teachings. But it quickly became clear that his intellect was not his only gift. As the youth aged, he began to display a level of strength that was all but unseen since humanity’s distant past. As the young man’s strength rapidly grew, 1-A realized that the existing styles of martial arts would insufficiently make use of the boy’s natural gifts. With that, 1-A set out to create a new martial arts style, one that would be “perfect” in form and function. It would fully exploit his champion’s rapidly increasing strength. 1-A’s teaching proved to be devastatingly effective. By the time the youth turned 15, he had been transformed into a living, breathing, thinking weapon, due to the combination of his burgeoning strength and 1-A’s “perfect” technique. At the completion of his training, the young man achieved a level of physical perfection never before achieved by any human being. He was fully capable of destroying robots with his bare hands. The young man who had taken the name Magnus. At 25, he emerged from 1-A’s hidden underwater layer and travelled to the city state of North Am. His objective was to do what he had been trained to do from his infancy. His timing could not have been any more perfect. When he arrived, he immediately found himself facing many difficult challenges. These ranged from destroying dangerous malfunctioning machines to thwarting madmen’s schemes. He became an instant celebrity amongst the North Am elite. When the free will robots ultimately appeared and threatened humanity, he did what he was born to do; he smashed them. Magnus’s adventures drew the attention of several admirers including that of the flighty, yet undeniably beautiful, Leeja Clane. Leeja was the daughter of the North Am president. She used her father’s clout to get close to Magnus, who found himself unable to keep the spoiled young woman out of danger. She constantly balked at his commands to stay away. Furthermore, her insatiable curiosity always managed to get her into trouble. Despite the turbulent nature of their relationship, Magnus found himself growing closer to the young woman. As Magnus’s feelings grew for Leeja, so did the number of free will robots. New free wills seemed to be “born” in an accelerated rate during his debut year. Magnus found himself responding to call after call, shattering rogue after rogue and fending off assassination attempts day after day. This continued until Magnus encountered a peculiar free will robot that went by the designation W23. W23 was a waiter robot that was serving Magnus during a presidential dinner. 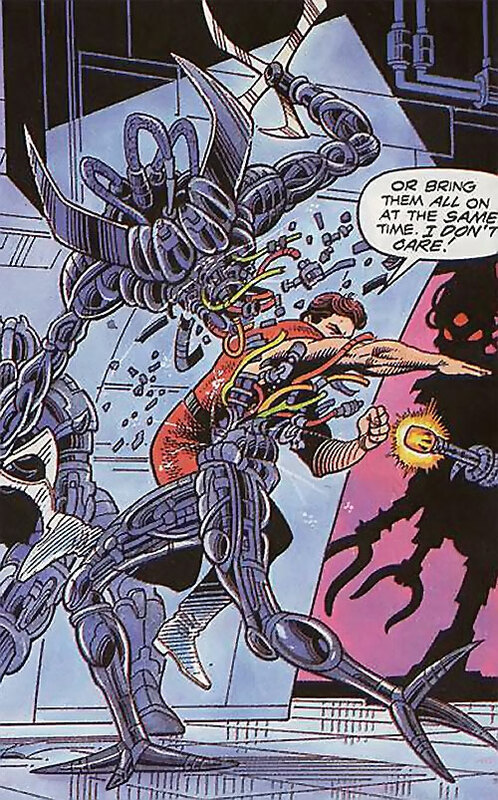 The robot was also a rogue free will robot that had managed to escape Magnus’ wrath in a previous confrontation. With Magnus’s attention focused on his meal and companions, W23 realized that it had an opportunity to strike at Magnus while he was unaware. The robot approached him from behind with a murderous intent in its mechanical heart. But killing robots isn’t murder … is it ? Despite W23’s attempt at stealth, and his utter annoyance at the soft and lazy politicians he was eating with, Magnus was not be taken by surprise. He easily repelled W23’s attack, but curiously let the robot escape once again. Later that evening, W23 stole into Magnus’ quarters and the two had a civil conversation. The rogue eventually convinced Magnus of what he already believed. Not all rogues were hostile yet they were all alive in a sense. For some time, Magnus had become disenchanted with simply smashing all rogues; he had slowly developed the belief that he wasn’t simply rendering them inert but instead that he was killing sentient living beings. W23 simply confirmed his suspicions. W23 left Magnus in peace, and would eventually become one of his closest allies. Magnus’ change of heart regarding free will robots didn’t make his life any easier. His mentor, 1-A could not understand this inexplicable change in his student and former ward. That was despite the fact that he, 1-A, was a benevolent free will robot. His former allies in the North Am government turned on Magnus, and charged him with treason against humanity for his new found sympathy for the plight of the rogue robots. But the worst part was that the free will robots didn’t believe in his change of heart, and continued to attempt to assassinate him. This resulted in more smashed robots. When it appeared that his situation couldn’t get any worse, W23 returned. The robot had refashioned its exterior to appear as an attractive human female and renamed herself Tekla. Tekla sought out Magnus. She asked him to help her usurp control of the steel nation (the name with which the free will robots referred to themselves). Magnus agreed to lend her his aid, but soon after he did a particularly nasty free will designated 0-1X took over all of North Am’s robotic police force. He also kidnapped Leeja in order to draw Magnus out. When Magnus failed to surrender and instead went on the offensive, 0-1X ordered her execution. Enraged, Magnus smashed through all of 0-1X’s forces. He eventually destroyed the mad robot. With 0-1X’s execution, Tekla realized that Magnus was too much of a polarizing force to be of much aid to her cause. With that she bid him farewell, but only after she revealed that she had strong feelings for him despite her robotic nature. But what she didn’t reveal was that Leeja still lived, having been rescued by Tekla’s allies before her execution. Rather than returning to the Milespires of North Am, Leeja opted to stay with the Steel Nation. Her constant need of rescuing and general lack of strength had finally frustrated her enough to make a change. She begged Tekla to teach her how to be strong, after reasoning that Magnus became what he was after training with 1-A. Eventually, Magnus also abandoned the golden spires of North Am and 1-A. He went to live in the low technology levels of the city state, populated by the dregs of society who called themselves the Gophs. Magnus continued to fight the good fight, defending North Am and the Gophs from anything or anyone that threatened them, despite his sudden lack of popularity. Despite his change in living conditions, Magnus’s life continued to grow more complex. His defection from the North Am government had branded him a traitor. He was continuously harassed by their forces who attempted to arrest him. He still continued to be attacked by rogue free will robots with a thirst for vengeance. Furthermore, the Gophs themselves weren’t exactly the easiest people to live with. Magnus found himself having to relearn how to survive without the creature comforts that he had gotten used to. It was during this time that the immortal Erica Pierce enacted her plan to rewrite all of reality. Erica was a god-like being who gained her powers in the distant past during the same accident that created Solar, the Man of the Atom. While her raw power was not as great as Solar’s, it was sufficient to grant her not only immortality, but also the means to enact her plan. Over her long life Erica had discovered a pocket dimension where all of time intersected, a so called Lost Land. In this dimension, dinosaurs roamed freely next to humanity in a constant struggle for survival. Erica realized that if she channelled her full power through a unique reactor that she had constructed within the Lost Land she would recreate the accident that created Solar in the first place, and literally destroy and rewrite all of reality. Unfortunately for Erica, Magnus and a group of heroes gathered from across all of time banded together to thwart her efforts. 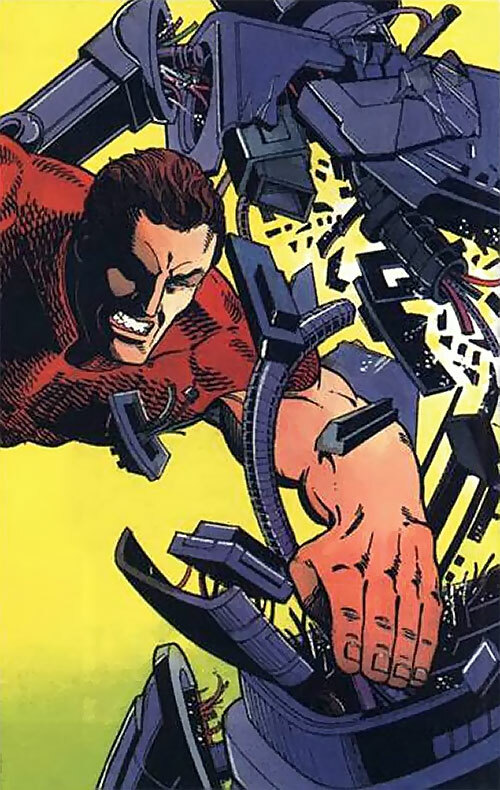 Magnus was recruited by the Geomancer of 41st century, Rokland Tate to take part in the battle. He made his way to the Lost Land through a dimensional doorway located deep within the mouth of an ancient cave found outside of North Am. Upon his arrival, he found himself caught up in a pitched battle which culminated on a direct assault on Erica Pierce’s stronghold. A group of youthful Harbingers. Rai the defender of 41st century Japan. Gilad Anni-Pada the Eternal Warrior. Aric Dacia and his Manowar class armor. The battle seemed to be going in the heroes favour until Solar fell in battle. With that Erica, who by then had taken the name Mother God, was able to focus her attention on the battle. Her power transformed the conflict into a rout. She forced Magnus and his allies to retreat into the forests of the Lost Land. Magnus spent the next 157 days fighting a guerilla war against Mother God and her forces. As time passed, the allied heroes lost more and more of their forces. XO Manowar left to form his own army against Erica. Rai was murdered in a suicidal assault against Erica’s forces. Peter Stanchek (the Omega level psionic leader of the Harbinger children) refused to fight in order to protect his pregnant girlfriend, Kris, who had accidentally found herself in the Lost Land alongside the teens. Even with their losses, Magnus continued to fight tirelessly. But he eventually received severe enough wounds (from Mother God herself) to render him helpless on the battle field. When all seemed lost, he found himself rescued by Peter. The youth had been sent to rescue him by a scared and desperate Kris. Puzzled yet grateful, Magnus returned to the allied base and wearily sat next to a recovering Kris. While he had been fighting in battle, she had given birth to a beautiful baby boy with bright blue eyes and dark brown hair. Magnus took the infant up into his arms and cradled the youth, showing a rare moment of softness amongst his allies, all the while failing to recognize the significance of the moment. With the birth of Kris’s baby, Pete found his willingness to fight rekindled. He desperately wanted to get Kris and the infant out of the Lost Land. Thus, with some guidance from the Geomancer, he led a final assault on Erica’s lair in the desperate hopes of freeing Solar. Never one to back down from a fight, Magnus joined the battle. But in his wounded stated, he quickly found himself overwhelmed by Erica’s robotic servitors. When all seemed lost, Solar miraculously returned to the battlefield after being freed from his captivity by Peter. Solar vaporized the robots that were assaulting Magnus with contemptuous ease. He then using his powers over time and space returned Magnus to the 41st century. As the Lost Land collapsed in the aftermath of Solar’s battle with Mother God, Kris found herself huddled in some wreckage, shielding her baby from the rampant forces that surrounded her. In the chaos and the confusion, she was approached by Geoff McHenry (the Geomancer of the 20th century). Geoff told her that the time had come for her to give up her son. Only hours before (in fact right before she sent Peter to rescue Magnus), Geoff had approached Kris. He revealed to her that he knew that Pete wasn’t her son’s biological father. Geoff also knew that the infant’s father was a young man named John Torkelson, a harbinger that had possessed great superhuman strength. He then told her that everything that had happened to her had occurred for a reason. Her pregnancy wasn’t an accident nor was her arrival in the Lost Land. He revealed to her that the future needed her son and that he had a greater destiny to fulfill … as Magnus, Robot Fighter. With tears in her eyes, Kris reluctantly bade her newborn son farewell and allowed Geoff to take the infant to Solar. Then, for the second time in a matter of minutes, Solar shifted Magnus forward in time to the 41st century. The baby reached 1-A’s waiting arms before the Lost Land collapsed about him. Like most heroes that were created during the 1960s, Magnus carries the requisite amount of muscle one would expect from a superhumanly powerful male, and yet he does not appear to be grossly out of proportion. Instead he possesses a superbly athletic, slim yet highly toned physique. Magnus is ruggedly handsome and has deep brown hair, and piercing blue eyes. In a different age, he could have easily been a movie star, model or some other form of celebrity. Magnus’ classic uniform is a simple one. It consists of a skin-tight, one piece tunic made of red ceramic-durium scale armor that runs from his shoulders down to his mid thigh. It is high collared, and leaves his arms completely bare from his shoulders down. A thick black belt wraps around his waist. The buckle of the belt is silver and has a large “M” emblazoned on it. Finishing off his uniform are a pair of stark white boots that run up to his mid-calf. In some ways, Magnus’ personality resembles the very robots he was raised to destroy. Due to isolated manner in which he was raised, Magnus had no human contact throughout his formative years. This meant a severe lack in social experience, which left him at a disadvantage when dealing with the human residents of North Am. However, over time, Magnus learned the intricacies of politics and social interaction. However, he still retained the unwavering (but somewhat naïve) determination that could be found in many of the free-will robots that he battled. This combined with is natural charisma made him a formidable, yet unsophisticated, personality. Magnus is a tenacious champion of whatever cause he believes in. In order to achieve his goals he is capable of sacrificing nearly anything. He fights with a manic pace and never gives in. However, when or if he’s forced to re-evaluate what he thought was “right” or “wrong,” he is fully capable of recanting his former position and fully committing himself to corrective action. This very personality trait has made him an enemy of both the free-will robots and the North Am government. 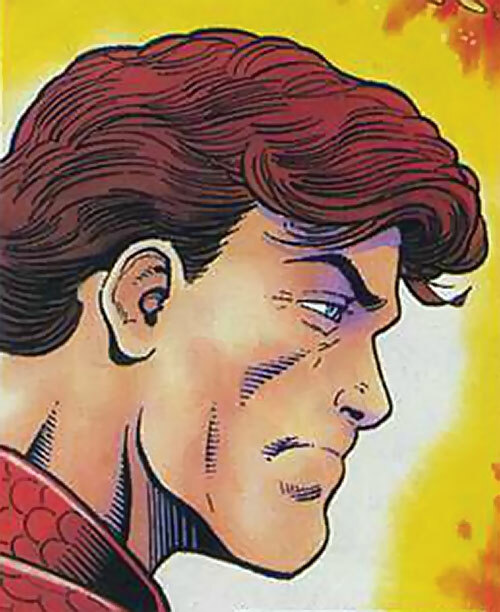 The one change needed to bring Magnus into the DC Universe would be to change the identity of his father. 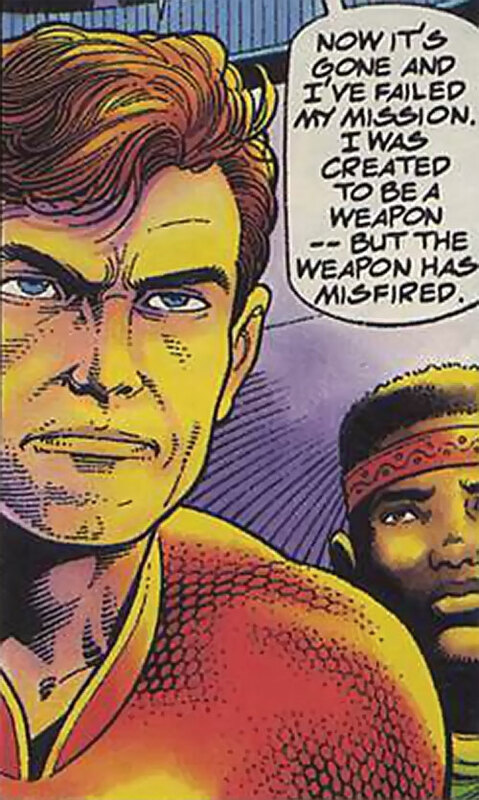 Use a character like Risk (Cody Driscoll) or Atom Smasher as his father, replace Unity with Crisis on Infinite Earths, and essentially the rest should be able to remain close if not the same. Sharpness: Can be combined with Martial Arts EV (+1FC); Sharpness is a Skilled Power (+1FC); Can only be used against humanoid robots (-1FC). Area Knowledge (North Am, Goph Undercity), Attractive, Credentials (North Am Government, High), Iron Nerves, Language (Goph Slang), Leadership, Popularity, Scholar (Robotic Design), Silent Assistant (1-A). Elzy (High), Slagger (High), Senator Zeramiah Clane (Defunct, High), Tekla (Low), York Timbuc (Low, Defunct), Willow Talltrees (High). BODY ARMOR [/BODY/ 08, Energy Absorption: 08. Bonuses & Limitations: Hardened Defences; Armor is Partial (Can be bypassed with a +1CS OV Trick Shot)]. After much deliberation, settled on a respectable 09 APs for Magnus’s STR. 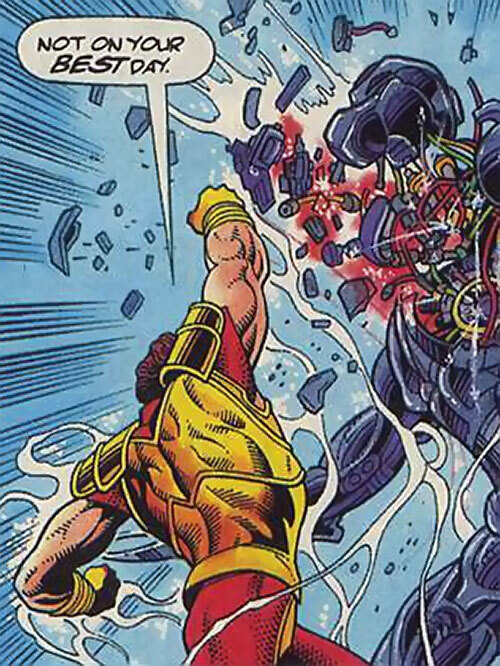 The Valiant universe in general is a lower powered setting, and despite him being one of the heavy hitters, Magnus has never demonstrated “mountain-moving” strength levels. 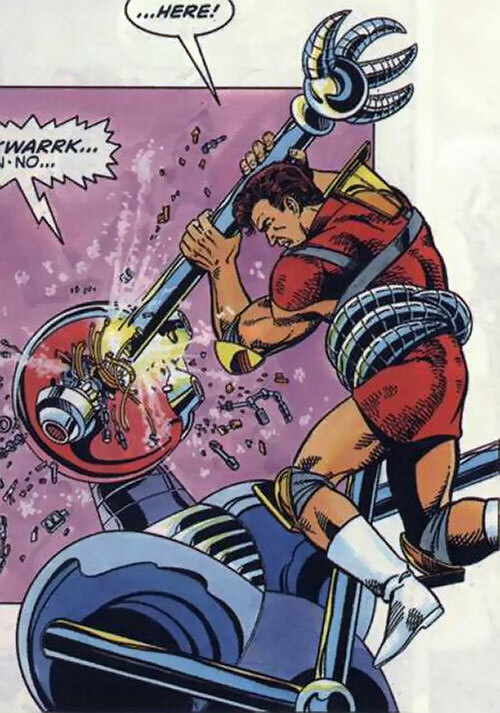 Gave Magnus the Sharpness Power to simulate his ability to constantly one-shot & maul his robotic opponents. Before losing faith in his mission to eradicate all freewill robots, Magnus had a unique receiver implanted in his head that gave him the ability to monitor the radio-pathic transmissions broadcasted by the freewill robots. This gave him the ability to eavesdrop on their conversations. Modelled in game, he had Radio Communications: 08 with the bonuses & limitations: Scrambled (+1); Receive Only (-1); and can only be used to receive signals from freewill robots (-1). He has since removed the implant, thus losing the ability. 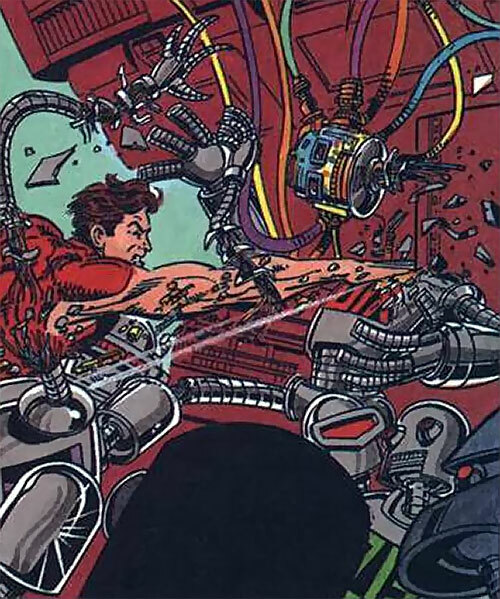 Source of Character: Magnus, Robot Fighter. Write-up completed on the 11th of June, 2012.